My favorite running shoe is the Saucony Grid Hurricane 7 (2005). Road Runner Sports sells them for $99.99. I got my last pair for $69 on Amazon. Recently, I bought a fleece vest to run in dry, cold weather. A similar vest at REI costs $35. Mine cost $14.95 on sale at Cabela’s. I love baggy, three-pocket running shorts. RRS’s men’s Stamina Plus shorts are on sale for $7.99. A good price, but I paid $3 at Goodwill. Simplicity has its charms. In 1998, I took a 10-day vacation on Kauai. I had little money, but I’d sold a Nikon F5 camera body for $1700, enough for a nice time. The buyer was slow to pay, and I ended up in paradise with a pre-paid rental car and rent plus only $300 to get by. I bought produce at the Hanalei farmer’s market, tofu from the supermarket, and picked avocados from the tree in the yard. It was wonderful. I felt closer to the island than if I’d had money to toss around. I’m obsessed with simple running gear. Toward the end of my career as an ultrarunner, my equipment for a 30-mile run/walk consisted of shorts, shirt, Camelback pack, water bottles, heart monitor, electrolyte pills, and a protein bar. I was wrong not to carry carbs (the runs were fine; the recovery was torture). But the simplicity of my kit was a positive pleasure. I loved the primitive sense of being close to nature, not separated by too much plastic fabric or electric doodadery. Winter is, of course, a different matter. Nevertheless, I find that simple gear is best even in the cool months. Here’s one of my favorites. This baby is a 3-layer sandwich. 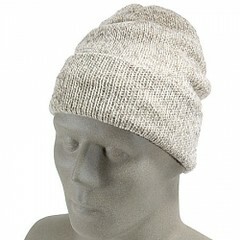 The outside is a gray twist of Wool Ragg, a tough fabric with great insulating properties, even if it gets wet. Next to your head is a soft, lightweight Acrylic fiber which wicks perspiration out of your hair (or skin, depending on your baldness quotient). No rough wool to get scratchy there. Waiting in the middle is that miracle man-made fiber, Gore-Tex, a waterproof, breathable membrane that lets water out into the wool layer, but not inside to make your head chilly. Cabela’s will be known to frostbitten runners from Minnesota, Wisconsin, and da Yoop. The huntin’, fishin’, and outdoors emporium carries over 200,000 products, with great prices and excellent quality. My $14.95 vest was highly rated in buyers’ reviews on the Cabela’s site. I’m sure the $179 Arc’Teryx Gamma SV Vest from REI is nice and comfy. Yet I wonder how much extra pleasure I’d get by paying $164 more. Let’s face it, last year’s shoes are often better, thanks to the manufacturers’ relentless habit of improving things for the worse. As noted earlier, I’ve found amazing bargains on last year’s shoes at Amazon and E-Bay. Another good place to look is Sierra Trading Post.